My one remaining link to Hull is going strong. We got a mention in the Guardian this week. Just love any attention, which is a little more deserved now we’re producing a video almost every week. I had what could be the ideal politics-geek day-trip last Wednesday. I awoke at ridiculous O’clock to travel from Sheffield to Westminster for the first Catch21 Productions conference since I joined them as ‘New Media’ bod. This was held in the Houses of Parliament itself. I was excited to get bumped to the front of the security queue and through St Stephen’s entrance. Inside we held the conference which involved a number of college/6th form kids asking questions to us and our guests. Guests included delegates from Operation Black Vote, The Electoral Commissionâ€™s and the UK Youth Parliament and also we were able to have a question and answer session with Charles Kennedy MP, Ann Widdecombe MP, current Education Minister Alan Johnson MP and Daisy McAndrew – Chief Political Correspondent of ITN. The audience asked some good questions which yielded some interesting answers. Catch21 will be displaying highlights from this event on our YouTube channel. 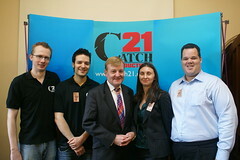 Personally, I enjoyed opportunity to meet some very significant MPs from the three main partys and we all got some ideas of where Catch21 can go as an organisation from a seemingly pretty keen audience. Besides, I get down to London so infrequently the Tube is still a novelty. I wonder how long that will last? It’s been low-blog count limbo round here for a while. I’ve been over-rung with websites to maul at work so I’ve been somewhat terrified to even look at a TinyMCE text entry box. What else have I done? Well, I’ve been all the way to Westminster in London Village to try and help raise some more funds for soon to be internet-sensation Catch21 Productions. Well, we hope. We’re certainly going to try. I reckon we could do some pretty exciting stuff with it anyway. More on that, hopefully much more, later in the year. BBQ this weekend down ‘sarf. Maybe next week I’ll reveal some shiny new website designs I’ve been working on. Oh larks oh lawdy! Hurrah! You are currently browsing the archives for the Catch21 category.